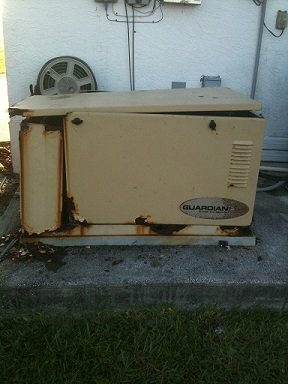 We are your Cape Coral generator experts, selling, installing, and servicing all types of generators. RCS Electrical Services specializes in Guardian generator repair, Generac generator repair, Centurion generator repair, Kohler generator repair, Briggs and Stratton generator repair, Onan generator repair, and many other brands of generator repair. We are also certified to do Generac generator installation, Guardian generator installation, Centurion generator installation, Kohler generator installation, Briggs and Stratton generator installation, General Electric generator installation, Onan generator installation, and others. Contact us now if you are in need of generator service, generator maintenance, generator installation, or generator repair. Please Review Cape Coral Generator Installation Costs Below. There are two basic types of generators in use today for residential and commercial applications; portable and standby. They each offer a unique set of advantages and disadvantages. In order to choose which one is right for you, it is necessary to understand your particular situation to determine which type of generator may best fit your need. When trying to determine which type of unit is best for you, the best choice is to find a professional generator technician that you trust, and consult with him about what type of unit is best suited to your application. Most reputable technicians will assess a consultation fee to come to you and analyze your particular situation. 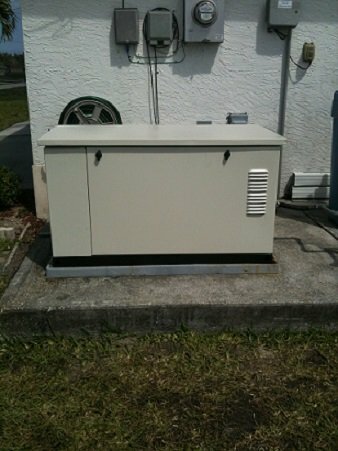 Your Cape Coral generator experts at RCS Electrical Services, have a small fee of $39.00. This fee is well worth the information you are going to receive. 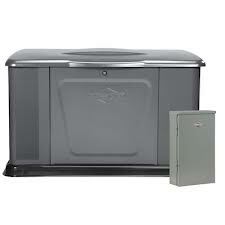 Standby generators are usually installed with automatic transfer switches. Transfer switches allow generators to monitor the utility lines. When the generator sees that the utility lines have lost power, it starts within five seconds. After the generator starts, it tells the transfer switch to disconnect the house or building from the utility lines, and then it sends electrical energy to the main electrical panel through the transfer switch. 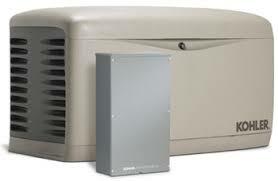 Read below to gain more information on the different brands of standby generators. 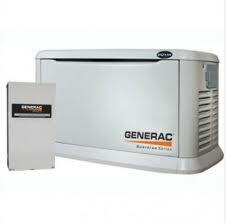 Generac is one of the leaders in the manufacturing and sale of standby generators. 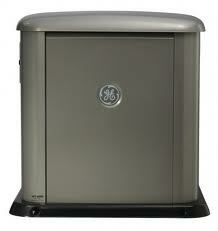 They offer a wide range of standby generators. You can pick from a small air cooled 7KW generator to a very large unit suitable for industrial applications. 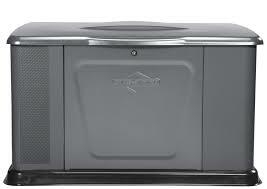 For most residential applications you will do well to consider the air cooled standby generators. If you feel your application needs a more robust generator, then you ought to opt for a liquid cooled unit. 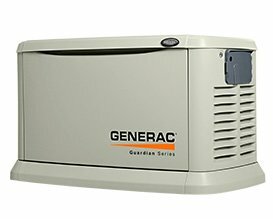 Generac has the Guardian series which includes 8KW, 10KW, 14KW, 17KW, 20KW, 25KW, 30KW, 45KW, and 60KW. They also have the QuiteSource series which includes the 22KW, 27KW, 36KW, and 48KW machines. I personally recommend these generators over the Guardian Series units. They are so much more powerful and robust, there is no comparison. This company is especially good with training and certifying their technicians, and very good with parts. You can order these generators with confidence, knowing that you will not be left with a unit that cannot be serviced. Their transfer switches are also very good, and do an adequate job at handling their task. Their price is affordable and the performance is good. Briggs and Stratton produce a very good generator. Their engines are superb, and are very easy to install, repair, and maintain. They are a relatively new player in the standby generator market, but they bring lots of great technology with them. One thing I love about their standby generator program is their transfer switch technology. They really have a great load control program. Load control is the technology that allows generators to know when they are carrying too much load. Through their transfer switch, they are able to disconnect certain large loads for a discrete amount of time. Sometimes they may disconnect your stove for a few milliseconds, and you don’t even notice, but it allows the generator to work well within its factory parameters, not exceeding its capacity or rating. Briggs and Stratton has many standby generator sizes ranging from 8KW to 48KW. There are larger sizes generator than the ones listed above. If you have a application that requires a larger unit, your Cape Coral generator experts, RCS Electrical Services can help with this also. Kohler produces a very robust and quiet standby generator. These units run very smoothly, and are extremely reliable. You will be pleased with the overall performance of this unit and will give you many years of trouble free service. Kohler has many standby generator sizes ranging from 8KW to 48KW. General Electric produces a generator which is an upgrade of an already good system. General Electric’s generators are manufactured by Briggs and Stratton. These are very sophisticated generators, that come with a very strong warranty program. As I said before, these units are an upgrade from the Briggs and Stratton generators. I want to emphasize that Briggs and Stratton already build a very good generator, therefore, GE units are just superb. You will be happy owning one. 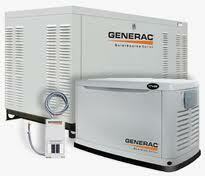 Generac Electric has many standby generator sizes ranging from 8KW to 48KW. If you live in any of these cities, or anywhere in the Lee County Florida area, and need our help, please call the number below.